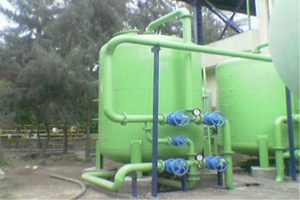 Activated Carbon Filter is the most common method of treatment for dechlorination and removal of colour, odor, Organic impurities & Residual chlorine from water, through adsorption of the compounds that cause these problems. Activated Carbon Filter operates through adsorption. Adsorption is directly related to the surface area of the media. This great surface furnishes a huge adsorption area for organic as well as chlorine molecules to attach themselves. This intermolecular attraction between the carbon surface and the substance that is being adsorbed can be altered by increasing the density of the carbon or by reducing the distance between the carbon surface and the substance being adsorbed.